BODUM Chambord Warmer Shiny . Bodum Tea for One Glass with Tea Infuser - 0.35 L, Black Infuser. Condition is New. Dispatched by Royal Mail 1st Class - signed for. Cooker Hobs. Cooker Parts. Flymo Appliance & Parts. Coffee & Consumables. Tumble Dryer Parts. Steam Iron & Spares. Made from borosilicate glass. Karcher Machines & Parts. BODUM Assam Teapot / Teapress. 1.0 Litre / 34 fl oz. Glass Teapot With Handle & Plunger. Colour = Black. Bodum Made in Switzerland Designed by C. Jorgensen Glass Tea Pot/ Infuser Forest Country Green It has been used and has signs of use but in good condition 5.2” around the rim and 5” high 1 litre capacity Please see my other items too Thank you! Brand new, unused Bodum glass teapot with plastic handle. Bodum ASSAM Tea Maker Teapot. Glass teapotwith plastic filter, handle and lid. Bodum Tea Press. New unused gift. £60 new. Dispatched with Royal Mail 2nd Class. Large 1 Litre Bodum tea pot/ diffuser. Never been used. Unboxed. WITH CLEAR TEA LEAF FILTER. Assam Glass Tea Press. Works with, Black, Green, Herbal, Loose Leaf or Tea Bags. One of, if not the best way to brew tea. Quick and easy to use. Tea and the British seem to be inseparable in our perception of English culture. When BODUM was asked by the British Tea Council to develop a new way of brewing tea we were rather proud. Design Line ASSAM. Flymo Appliance & Parts. Coffee & Consumables. Carpet Cleaners. Tumble Dryer Parts. Carpet Shampoo. Steam Iron & Spares. Quick and easy way to brew tea. Health & Beauty. Silicone plunger - locks tea leaves into the bottom of the filter. Perfect for use with any loose leaf tea or tea bags. Stainless steel filter. Silicone rim - secures filter firmly for precision pouring and stays cool. Bodum Assam Herbal Tea Press . 1 Litre. White Handle. Bodum Assam Tea Press. White Handle. Condition is Used. The ASSAM Tea Press is the icon among the wide variety of BODUM Tea Presses. 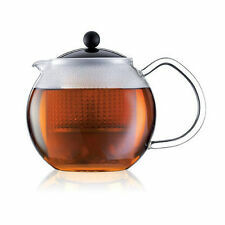 Its classic round shape and borosilicate glass let all teas shine in their best light. Contrary to non-transparent pots, the glass pot allows the distinct colour palates to be viewed as they are a big part of any tea lover's delight. Bodum round glass teapot. With silver & black lid & handle. “Tea brewing doesn’t get any purer than with the Bodum tea presses. This unique system makes sure your tea is brewed precisely to your desired strength and aroma. Most of the Bodum tea presses are made of borosilicate glass which doesn’t stain and doesn’t give off any taste. BODUM ‘KENYA’ No.1766 Teapot. Borosilicate Glass with Black Holder, Lid & Handle. NEW & Unused - Been in a Cupboard for quite a while so Box a bit battered. With Infuser for brewing loose leaf tea. A lovely retro looking contemporary Bodum teapot, designed for loose teas or herbal teas (or teabags I suppose). It's black colour-coded. Kenya design. Round shaped Bodum glass bowl with clear plastic filter with inner plunger which can all be easily be removed, black plastic lid, and black hard plastic handle/outer design. Cup removes from holder for proper cleaning. Assam tea press. Jam & Chutney Making. Saucepans & Milk Pans. Tea & Coffee. The tea press features a glass handle and black plastic lid with and plastic filter basket and has a capacity of 500ml/17oz. Capacity 1 Litre. Borosilicate Glass jug. A lovely retro looking Bodum teapot, designed for loose teas or herbal teas (or teabags I suppose). Half sphere shaped Bodum glass bowl with red plastic filter which can easily be removed, loose red plastic lid, and red hard plastic handle. Clear glass. Great for use with loose leaf tea. Condition: New. This is a unused Bodum Tea pot with infuser. You can see by the pictures the condition is immaculate. Bodum assam teapot brand new glass. Condition is New. Dispatched with Royal Mail 2nd Class. Jam & Chutney Making. Saucepans & Milk Pans. Tea & Coffee. The silicone plunger locks tea leaves into the bottom of the filter once brewing is complete, cutting off access of water to the tea leaves. Mouth blown glass. Stainless Steel Filter. Perfect for use with loose leaf tea or tea bags. 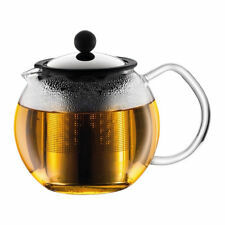 Silicone rim secures filter firmly into the teapot for precision pouring, and stays cool to the touch for safe removal. Bodum Assam Tea Press With Glass Handle 1.0 Litre Black. Condition is New. Dispatched with Royal Mail 2nd Class. This Bodum Assam tea press is easy to use and can be used with tea bags or loose tea. Borosilicate glass jug with black plastic handle and lid. Plastic infuser. 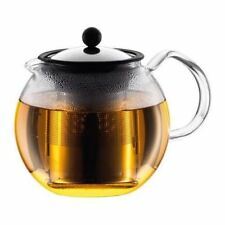 Bodum Columbia Teapot *Brand New* . Condition is brand new only taken out of the box to photo for this listing Unwanted Christmas present Lovely looking Teapot Bodum Columbia teapot is a must for every tea lover! It has a classic and elegant design in stainless steel with great heat retention. It´s easy to use and has the same brewing function as Bodums French coffee press. Just add tea, hot water and press when the brewing is complete. A functional tea press with a design that enhances the tea experience! Assam tea press. Jam & Chutney Making. Saucepans & Milk Pans. Tea & Coffee. The tea press features a glass handle and black plastic lid with and plastic filter basket and has a capacity of 1L/34oz. Once it has reached your desired strength, simply press down on the plunger to seal the tea leaves at the bottom of the basket where there are no holes. Assam tea press. Jam & Chutney Making. Saucepans & Milk Pans. Tea & Coffee. The tea press features a glass handle and off white plastic lid with and plastic filter basket and has a capacity of 500ml/17oz. You can use the BODUM Chocolatiere for hot and cold liquids and is great for frothing milk prior to adding to a cup of coffee. Treat yourself to a large mug of hot chocolate just before going to bed with the hot chocolate maker from Bodum. Bodum Assam Tea Press 1.0 Litre Black Ref: 184401. Jam & Chutney Making. Saucepans & Milk Pans. Tea & Coffee. The silicone plunger locks tea leaves into the bottom of the filter once brewing is complete, cutting off access of water to the tea leaves. The silicone plunger locks tea leaves into the bottom of the filter once brewing is complete, cutting off access of water to the tea leaves. Allows tea to be recycled for multiple uses. Silicone rim secures filter firmly into the teapot for precision pouring, and stays cool to the touch for safe removal.